People frequently ask about feasible solutions between 10G and 40G servers. 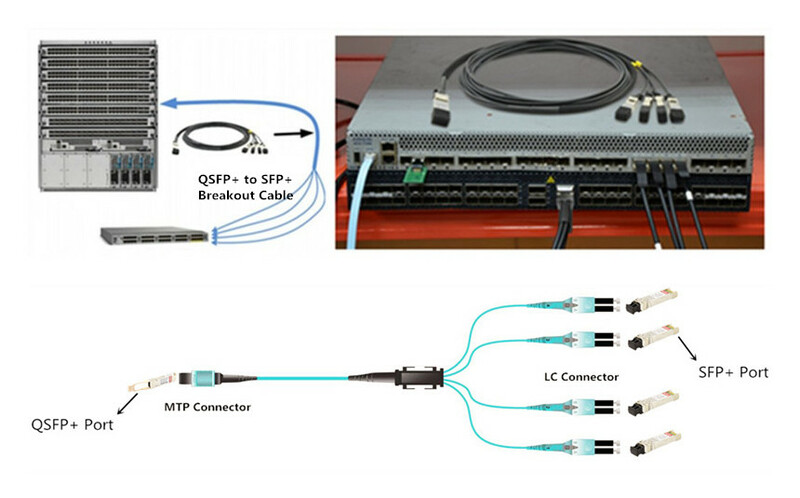 QSFP+ breakout cables like QSFP+ to 4 SFP+ cables and MTP to 4 LC harness cables are the commonly used equipment to connect between QSFP+ ports and SFP+ ports. But recently, Cisco launched a new type of product—QSFP+ to SFP+ Adapter (QSA Adapter) module that could provide a smooth migration to 40 Gigabit Ethernet. Is it a better solution for the 10G to 40G migration? Should I use the QSA adapter or 40G QSFP+ breakout cable? This article will answer the above questions and provide some suggestions to you. QSA Adapter—Is It a Better Solution for 40G Migration? The QSFP+ to SFP+ Adapter (QSA Adapter), specified by Cisco, is the module built in QSFP+ form factor with a receptacle for SFP+ cable connector at the back (seen in the below image). When connecting the QSFP port to an SFP+ port, QSA adapter usually acts as an interface for SFP+/SFP cables. That means you can effectively plug in an SFP+/SFP optics operating at a 10 Gbps port on this module, then inserting the module into a QSFP port cage to realize the 40G Ethernet transition. QSA adapter ensures the smooth connectivity between 40 Gigabit Ethernet adapter and 10 Gigabit hardware using SFP+ based cabling. Therefore, once the QSA adapter came out in 2016, it was soon considered as the effective solutions for converting 40G ports to the 10G ports. QSA Adapter or QSFP+ Breakout Cable? In this part, I will make a comparison between QSFP+ to SFP+ adapter modules (QSA Adapter) and QSFP+ breakout cables from the aspects of cost, performance and compatibility. QSA adapter module is not certificated by Multi-source Agreement (MSA), but a sole source paradigm defined by few vendors. The only vendor owns its patent, so the QSA adapters on the market are quite expensive. Nevertheless, QSFP+ breakout cables covered in the MSA standard, support both copper and optical connectivity, which are much cheaper than QSA adapters. Cost comparison between QSA adapter and QSFP+ breakout cable (DAC, 1m) is listed in the below table. With QSA adapter, users have the flexibility to use any SFP+/SFP optics to connect to the 40Gbps data rate with a single 10G connection. However, QSA adapter only exists in 10G-40G speed, which also explains the reasons of its unpopularity of the market. QSFP+ to 4 SFP+ breakout cables split the 40G channel into 4x10G channel which provide four times more data transfers than QSA adapter does. QSA adapters, according to Cisco, are available in 40 Gigabit Ethernet compatibility matrix. Cisco SFP/SFP+ transceivers that can be plugged into the QSA adapters are concluded as Cisco 10GBASE-SR, LR, ER, ZR, DWDM SFP+, FET-10G and 10G SFP+ cable as well as SFP (1000BASE-T, SX, LX, EX, ZX). As for the QSFP+ to SFP+ breakout cables, different vendors have different compatible issues. Keep in mind that you should find the reliable fiber optic transceiver manufacturers. Before using the QSA adapters or the QSFP+ breakout cables to connect a 40 Gigabit Ethernet port to a 10 Gigabit SFP+ port, you must enable the fan-out mode of your devices. With the QSA adapters, you can directly use the SFP+ modules in a QSFP+ port, but you cannot use the QSFP+ optical cables in a QSA setup. Telecom industry has been modified rapidly. Hence, it is more cost-effective to make additional investment in high-speed switches instead of breakout cables and expensive QSA adapters. Both the QSFP+ breakout cables and QSA adapters provide a smooth migration to the 40 Gigabit Ethernet. With these optics, you can reuse the existing 10G SFP+ cables, optical transceivers and switches when upgrading to 40G Ethernet. QSFP+ breakout cables is regarded as the cost-effective and reliable solutions for the most situations, but QSA adapter is preferable for the application with a single 10G connection. This entry was posted in Fiber Optical Transceivers, QSFP+ transceiver and tagged Cisco QSFP to SFP+ breakout cable, fiber optic transceiver module suppliers, QSA module, QSFP+ to SFP+ Adapter Module, QSFP+ to SFP+ breakout cable on March 7, 2017 by Angelina.Li. This entry was posted in Fiber Optical Transceivers, QSFP+ transceiver, QSFP28 transceiver and tagged QSFP+ modules, QSFP+ optical transceivers, QSFP28, QSFP28 modules, QSFP28 optics, QSFP28 transceivers on March 2, 2017 by Angelina.Li.